Home » Josie Duggar Turns One! Josie Duggar, the 19th child in the famous Duggar family, has reached her first birthday! Born premature after Michelle had complications during her pregnancy, the little girl is considered their “miracle baby”. 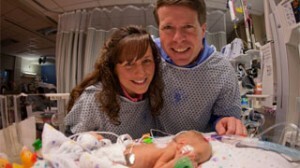 With round cheeks and curly hair, it is hard to imagine Josie Duggar as the tiny 1 pound 6 ounce baby she once was. Born at 25 weeks, the youngest baby of the Duggar clan has reached an important milestone in her life- her first birthday! The day of her birth was a traumatic event for then family. Michelle Duggar worried at the time that she would not survive because of her small size. Josie has proven to be a fighter, however, and is growing like a champ. 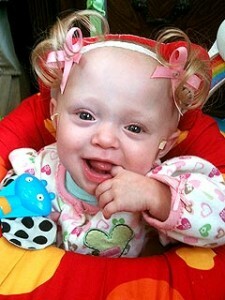 Because of her prematurity, Josie is still a tiny girl. At only 15 pounds and 12 ounces, she is slightly behind other one-year-olds. However, there is no reason why she shouldn’t catch up easily as she grows. Jim Bob and the oldest children are currently in El Salvador completing a mission trip, but that didn’t stopped Michelle and the younger children from having a birthday party. The family decorated and hung a giant number one on the wall and Michelle plans to have pictures of Josie taken with her daughter Jordyn and her granddaughter, Mackynzie. Jordyn will be turning two-years-old later this month, while Mackynzie turns two in October of next year. Congrats to Josie my daughter was a 22 weeker 1pound 1oz and she is 10 months old stayed in the NICU until she was 8 months and her name is also Josie.